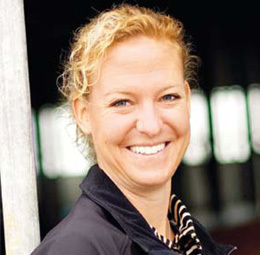 Berit Mül­ler talks about complete systems weighing several tons that come from Rottweil and conquer the whole world. Click here for the newsletter article on the chambers of WSS AKTIV BERATEN®. The interview is on page 5. The European Patent Office has patented the invention by Au­gust Mül­ler GmbH & Co. KG of Mobile Roller Screen VR-35. 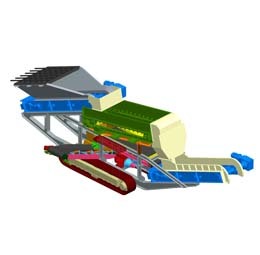 The invention consists of the continuous gap adjustment of the four axles on the roller screen throw-out by 35 mm to improve the dedusting of the feed material and make the process more flexible. 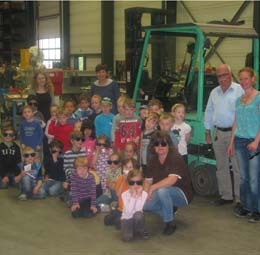 Twenty-nine children from the Old Town Nursery walked to the premises of the company Maschinenbau A. Müller on the Rheinwaldstrasse to learn a little bit about magnetism and steel. Au­gust Mül­ler GmbH & Co. KG has boldly developed a new caterpillar system for market areas that the company has not yet served. The new production site of Au­gust Mül­ler GmbH & Co KG on the Rhein­wald­strasse in Rott­weil is now complete. Managing directors Jo­chen and Berit Mül­ler are delighted with this pioneering step. It is an important base for the further expansion of the traditional company from Rottweil. We construct roller screens, chain conveyors and other accessories for quarries for national and international customers. 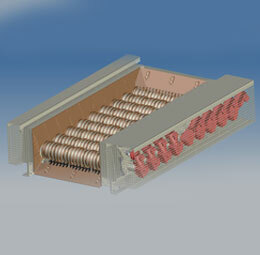 We also devise projects for complete systems.